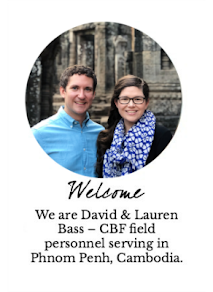 David and Lauren Bass: DOESN'T THE U.S. NEED MISSIONARIES, TOO? DOESN'T THE U.S. NEED MISSIONARIES, TOO? During our January visit to Cambodia, Lauren and I had the privilege of attending a Sunday morning worship service at one of the Cambodia Baptist Union’s churches in Phnom Penh. The worship service itself was meaningful, but what I want to tell you about today is the car ride to church. What’s so special about a car ride? Besides the fact that riding in a car meant that I didn’t have to haggle for a tuk tuk ride, of course. Riding in the car with us were two representatives from the Japan Baptist Union: the first was moving to Cambodia as a missionary with his wife and kids later in the year to work with the Cambodia Baptist Union, and the second was the director of global missions for the Japan Baptist Union. On a whim, I asked them about the state of Christianity in Japan. They informed me that less than one percent of Japanese claim to be Christian. Yet, here they were, preparing to send a young family to minister in Cambodia. A number of well-meaning people have asked me why I would go to some distant country. "After all," they ask, "doesn't the U.S. need missionaries, too?" There is no doubt that some people are called to live out their Christian faith by putting down deep roots in the U.S., living and working to introduce Jesus' kingdom to the least evangelized and most marginalized populations within our borders. However, the two Japanese believers with whom I shared a car ride understood something essential about God's heart. Their country has far fewer Christians—and thus could use far more missionaries—than the United States. Yet here they were "wasting" a young, missions-minded family on some other country. And I believe God is pleased by this. The subtle belief underlying the "Doesn't the U.S. need missionaries?" question is that missions is weakness. The missionary goes from strong and capable in their home country to vulnerable and inexperienced in the host country; the home church loses a valuable member. The missionary exchanges strength for weakness, and the home country is weakened as a result. But if our God is a missionary God, sending Jesus to us as a model for how he will send us to the nations (John 20:21), then the part of missions that seems like weakness is actually strength. The nations are strengthened when they are invited to embrace God's kingdom. The missionaries are strengthened when they find themselves in the middle of God's plan to redeem this world. And the sending churches are strengthened as they form global partnerships and get a bigger picture of who God is and what he's up to in this world. As Paul said, "for Christ’s sake, I delight in weaknesses, in insults, in hardships, in persecutions, in difficulties. For when I am weak, then I am strong" (2 Corinthians 12:10). Missions is not a game of Risk, in which you wait until you have enough armies in one territory to attack the armies in another. Missions is about having "the same mindset as Christ Jesus" (Philippians 2:5), who emptied himself of the privileges of being God because there was work to be done, and some of that work could only be done by leaving home and going out into the world. Doesn't the U.S. need missionaries, too? Yes it does. And by obeying the missionary God who is sending us to Cambodia, we are strengthening the U.S. church to fulfill its missionary calling. What role are you playing in strengthening the church to fulfill its calling? Will you join me in delighting in weakness so that together we may know true strength?